A controversial decision to grant parking to the University Park complex has raised questions about possible conflicts of interest and favoritism by the Cambridge city government. On Dec. 12, the Cambridge Interim Parking Control Committee granted a request by Forest City Development for 860 parking spaces for the complex, which is being built on land owned by MIT. The decision was the first made by the IPCC, which is responsible for allocating spaces under a Cambridge parking freeze. The parking committee was formed late last year. 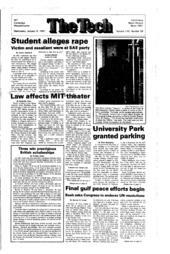 Conflict of interest questions arose because the chairman of the IPCC, Edward D. McNulty, is also a lieutenant for the MIT Campus Police. The Cambridge City Council asked City Manager Robert Healy to investigate the possible conflict in early December. After investigating a financial disclosure by McNulty, Healy reported that there was no conflict of interest. Debra McManus, also a member of the IPCC, said that the controversy "portrays the IPCC in a bad light. It was not a positive way to start our tenure [on the committee]." Some Cambridge citizens opposed McNulty's appointment to the committee. A lawyer for Peter Valentine and William Noble, who are both tenants in buildings owned by MIT near University Park, claimed at the hearing that McNulty's presence "casts doubt on the entire review process." McNulty declined to comment extensively, saying only that he had lived in Cambridge his entire life and is "very qualified" to chair the committee. McManus cast the single vote against the University Park request in the 2-1 decision. "The other members of the committee felt there were enough spaces available to grant the request," she said. The number of commercial parking spaces in Cambridge is limited by a city ordinance to 500 more than existed when the ordinance was passed, McManus explained. Spaces within garages or parking lots that close become available elsewhere in the city. The closing of the temporary garage at Lechmere and an MIT lot on the corner of Main and Ames Streets freed an additional 700 spaces, but McManus contends that these should not have been redistributed. "Both Lechmere and the MIT lot were temporary spaces," she said. "By making them available to other developers, you are in effect converting them from temporary to permanent. From my point of view, you can't do that." The third member of the committee, William Corkery, was not available for comment. The IPCC decision was also surrounded by accusations that the University Park request was unfairly heard first. The Athenaeum Group, which owns the One Kendall Square complex, alleges that the city enforced the parking freeze illegally. David Clem, a partner in the group, said that Athenaeum filed an application for 1530 commercial parking spaces in the One Kendall Square garage in early 1989. The application "was not acted on until July 30, 1990, when [Athenaeum] received a notice rejecting the application," Clem said. The same day, the city entered into an agreement with the state that provided for pending requests to be heard in the order they were filed, Clem added. Athenaeum filed a suit against the city, alleging it had been treated unfairly. A Middlesex County judge ruled in early December that the One Kendall Square garage would be "exempt from any freeze," Clem said. University Park project developer Jack Dobson said that Forest City "appreciated the way the situation was resolved. The circumstances were putting [Forest City] and Athenaeum against each other, but that's past history." Forest City Development was chosen by MIT to develop the University Park site.